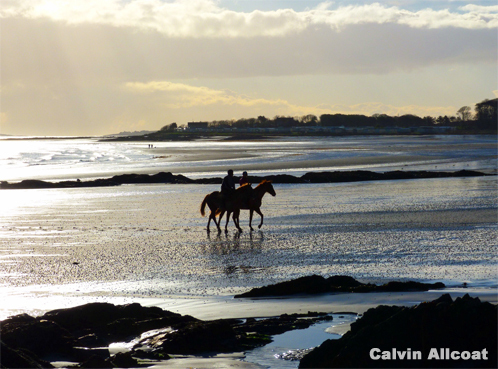 Ballywalter is a superb little village worth taking time to explore. It is an excellent place for picnics, with a choice of three beautiful beaches to choose from. From the working harbour you can enjoy fantastic views across the North Channel of the Irish Sea to the Scotland, (in fact, Ballywalter is closer to Scotland than it is to Belfast). Immediately behind the village is the small sheltered harbour bay with adjoining play park and easy access to the village shops and facilities. The north shore is easily accessed from the village, with a fine sandy beach that is sheltered from large waves by an offshore reef. South shore is a beautiful expanse of sandy beach, ideal for bathing and watersports, or long walks as far as Roddens townland the far side of the headland (tides permitting). There are three well-positioned carparks close to the shore at each of the beaches, which offer wonderful vistas of the seascape if you don't feel like getting out of your car. To the south-side of the village you can't help but notice the grand gates to Ballywalter Park, the residence of Lord Dunleath. Ballywalter Park - Ballywalter Park is the home of Lord & Lady Dunleath and it has been in their family for 170 years. The Mansion House was built in the Italianate Palazzo style by the eminent architect Sir Charles Lanyon and has been afforded Grade A* listing as being of exceptional architectural importance. The house is surrounded by 30 acres of pleasure grounds and is situated within the walled demesne of some 270 acres. The total Estate runs to over 1200 acres and is home to one of Northern Ireland’s largest dairy herds, and includes significant acreages of arable crops and mixed woodland. Fast Track Farm and Crazy Golf - Crazy farm golf is an 18-hole themed golf course. Designed in the shape of Northern Ireland with 3 holes in each county, and rich in information of Northern Ireland history and culture. Situated on a working farm it also has information on Northern Ireland's farming history with authentic farm machinery integrated within the theme. Bouncy castle and table games are available for birthday parties. Laser Clay Pigeon Shooting is also available. Floodlit track for winter riding. Lime Kilns - the old Lime Kilns are located at the village-end of the south shore - you can't miss them. The lime kilns were in use at Ballywalter in the early 18th century. The lime was brought to Ballywalter in small sloops carrying about 70 tosn; it was brought from Whitehead in Antrim and also from near Drogheda. The boats beached below the kilns at high water. When the tide ebbed the lime was unloaded into barrows and hand carts, which were kept in a store beside the kilns. It was then wheeled to the top of the kilns where it was dropped onto the burning coal and wood; when lit burned for 24 to 36 hours. Stories were told about people from the village going there on winter nights to get warmed. When processed, the lime could be bought by the bucketful for people to whitewash their houses or buy barelfulls by farmers to spread on the land to improve the soil. Lime mortar was also made to which animal blood from a local slaughter house, this acted as a setting agent and was used in building the walls round what is now the Dunleath Estate. Skullmartin Perch - From Ballywalter harbour, looking in an easterly direction about a mile out to sea you will notice a cage-like beacon on a reef. The reef is the notorious Skullmartin Rocks, and the cage-like beacon is known as the Perch. It is 11metres high, and is designed to accomodate up to 20 shipwrecked men while the seas cover the rock at high tide, allowing for rescue. The Perch was designed by Admiral Blessington, head of the coastguard in Ballywalter after the sinking of the vessel Castlemaine in 1877 with the loss of 25 crew who were washed off the rocks as the tide rose. Whitechurch (Whitkirk) - Just a little way up the Dunover road towards Carrowdore, you'll see a signpost to the cemetry to the right: this is Whitechurch. First recorded in 1306 in the taxation rolls of pope nicholas but it is believed that some of the features of the church walls are perhaps medieval. There are two full norman coffin lids and one broken one at the side of the building. Arthur Lusks headstone inside the church records the fact that he circumnavigated the globe with Lord Anson in 1753. The oldest gravestone is to John Cooper an Ulster Scot who died aged 90 in 1608. He had emigrated to Ulster in 1606.